Te Tumu Paeroa is an independent, professional trustee organisation that provides services to Māori landowners. They manage 100,000 hectares of Māori land, over 85,000 owner accounts, and $88 million in funds. In 2016, Te Tumu Paeroa asked us to increase digital engagement and improve the overall customer experience. Their site hadn’t been updated for some time, wasn’t responsive, had slow load times, and lacked an intuitive content structure. This led to a lot of unnecessary calls from their customers. The work Springload did to make our website more accessible has met our business goals and improved the customer experience immeasurably. 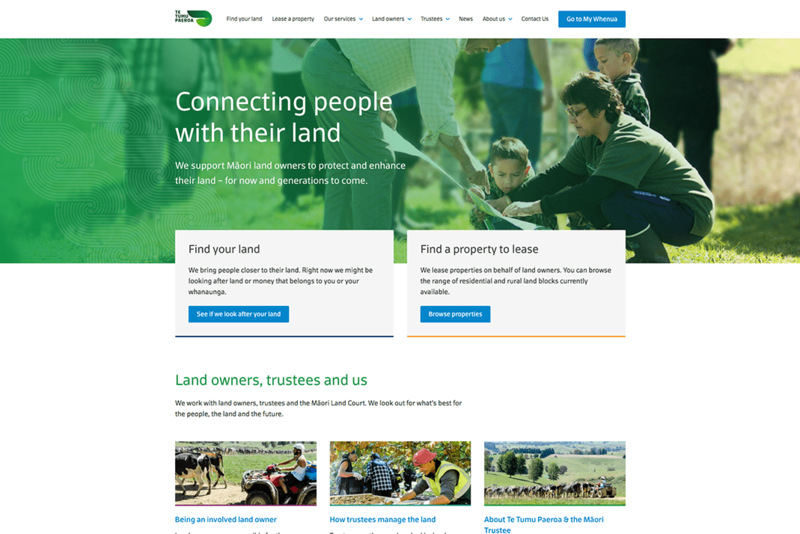 We embarked on a full website redesign and re-platform, working in partnership with Te Tumu Paeroa and under their te ao Māori framework. We reorganised their information architecture (IA), created a content strategy and seamlessly integrated a CRM. implemented a content production plan, and managed the production and editing of new content. Te Tumu Paeroa can capture more data about customers and trustees. Our customers appreciate the increased information they can access directly through our website. reduced calls and complaints to their customer service. Together we’ve created a solution that meets Te Tumu Paeroa’s goals to increase digital engagement and improve overall customer experience.